Andy H: Looks like a quieter comic haul this week. 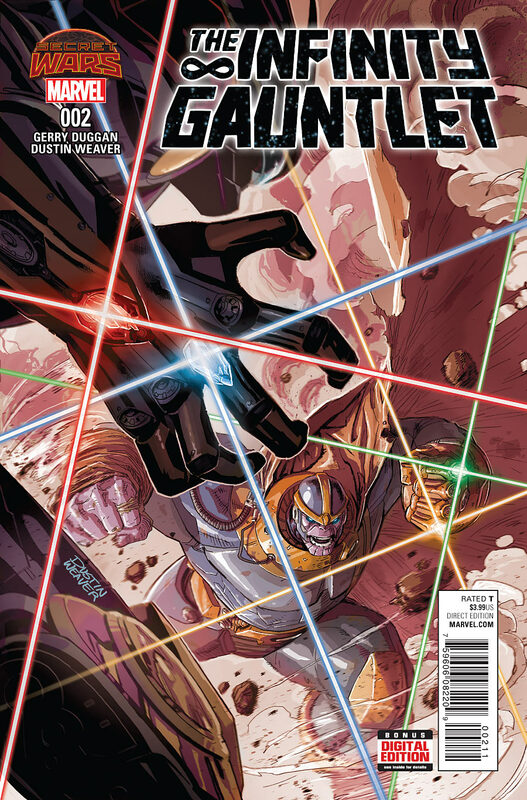 The Secret Wars spin-offs are up and running and I'll be picking up Infinity Gauntlet #2 on Wednesday. 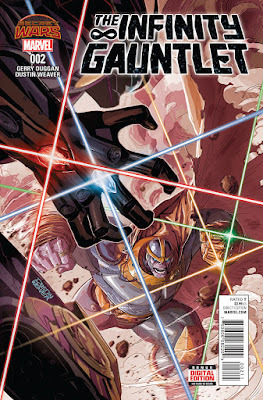 Writer Gerry Duggan and artist Dustin Weaver got the series off to a cracking start and this issue promises Thanos. Which Thanos is any one's guess, but it's a Thanos! For a nostalgia kick it may be worth picking up X-Men '92 #1. I'll be honest, I don't recognise the writers' names but I have fond memories of the '90s X-Men so I'll give them a chance. Mark Waid's S.H.I.E.L.D. series has the added benefit of being one-story-per-issue so it's easy to dip in and out of. Issue #7 features (as seen on TV!) Skye and her father, Mr Hyde. I used to be a massive fan of Green Lantern but after the endless crossovers of the New 52 versions, I'd had enough. Looks like Cullen Bunn may be able to tempt me back with Green Lantern: The Lost Army. John Stewart, Kilowog and a few other Green Lanterns find themselves stranded in space with no idea where they are or how they got there. Nice! Finally we have Surface Tension #2. Written and beautifully drawn by Jay Gunn, we find out more about the people that disappeared into the sea. All were presumed dead but when they start showing up with no memory and blue skin you know you'll want to find out why. Kenny J: Nostalgia is the word of the week. The X-men cartoon from the early '90s - 1992 to be exact - was the catalyst that kickstarted a lifetime of comic fandom, so the return of the animated versions of our favourite mutants in the pages of X-Men ‘92 #1 has me excited. Even though these characters exist within one of the many lands that make up Secret Wars’ Battleworld, I’m hoping to find the X-Men in the same shape in which I was originally introduced to them all those years ago ie. square-jawed Cyclops, non-vampire Jubilee, and a living Wolverine. At the other end of the scale there is another Secret Wars X-book out on Wednesday, namely E Is For Extinction #1. Taking its title from the initial arc of Grant Morrison’s New X-Men run, this book will revisit another of my favourite X-team iterations: a team consisting of mostly mutant misfits including Angel (not that one), Quentin Quire and the Stepford Cuckoos. Add to this it is being written by sometime Morrison collaborator Chris Burnham, and I think this might just pip X-Men ‘92 in the anticipation stakes. Bringing things more up to date, Batgirl #41 is back with its second arc. I thought the first fives issues of this refreshed book were interesting, modern and beautifully rendered by Babs Tarr. More of that please, as well as Fight Club 2 #2 and The Legacy of Luther Strode #2, both quality books about men punching each other but with very differing modus operandi.